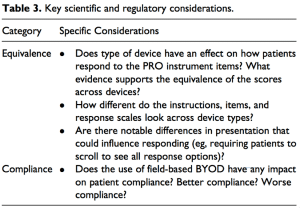 The adoption of “Bring Your Own Device” or BYOD in clinical trials has been slow, but the topic generates a fair amount of discussion and debate. The pragmatic case for simply allowing patients in research programs to use their own mobile phones as tools to collect and report data is easy to make. But there are numerous considerations that make this a hard decision. BYOD is gaining acceptance. Every stakeholder involved in the research process has something to gain by improving how we do this. 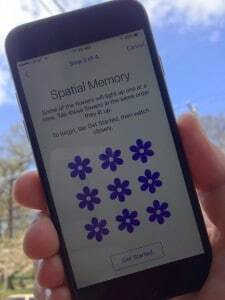 One exciting example of this is ResearchKit from Apple, “a software framework for apps that let medical researchers gather robust and meaningful data.” The mPower Mobile Parkinson Disease Study is just one innovative implementation of this framework in a BYOD setting. Reducing cost is an important benefit, but not the only benefit. Privacy Concerns in some cases can be amplified when using BYOD. “Mixed Modes” concerns regarding measurement equivalence require specific planning and accommodation. While these considerations, and regulatory opaqueness, have slowed adoption, there are many instances where BYOD has been successful, either in it’s implementation or in the eventual success of a clinical trial. Adoption of new technology has always been a challenge in clinical research. For technology providers and technology evangelists, the most common challenge heard from a sponsor is “Well, will the FDA accept my data?” or “Have any successful NDA’s included this kind of technology?” It’s a chicken-or-egg problem that can be solved through open dialogue and deliberate planning. What is lacking from the discussion on the use of BYOD is more hard data on outcomes and experiences. As sponsors begin the process of utilizing BYOD in their studies, the data from the outcomes collected this way, or data related to the mode of collection and methodology, will be useful to the field in understanding how this can make our research more effective for patients. This fall, at the Society for Clinical Data Management Annual Conference in San Diego, Adam Butler from Bracket will chair a Panel Discussion titled “Challenges to the Adoption of Bring Your Own Device in Clinical Trials.” The Call for Abstracts is now open. If you have insight from your own work in implementing BYOD in a clinical trial, this will be a good opportunity to share those experiences with an audience eager to learn more. You can find the submission guidelines here.